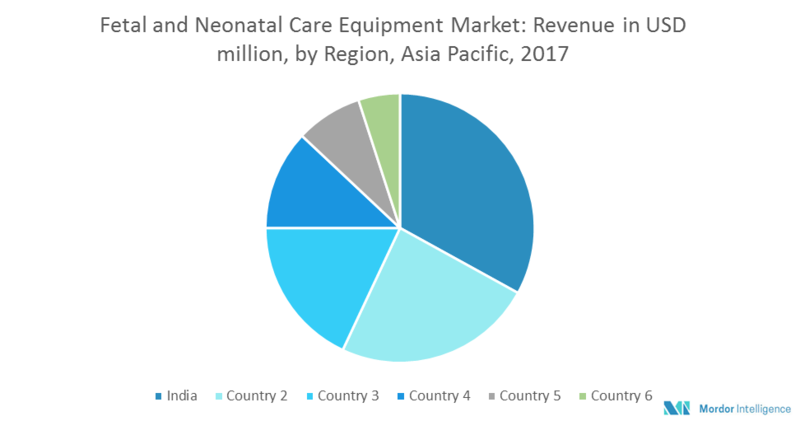 The Asia-Pacific fetal and neonatal care equipment market has been estimated to register a CAGR of 9.6% during the forecast period of 2018–2023. The fetal and neonatal care is primarily focused towards the child’s health and diseases from the perinatal period to adolescent stage. With increasing healthcare facilities, rising healthcare expenditure and fast-growing population, India is expected to have the largest market share, followed by China. The rise in the preterm and low-weight births of newborns is one of the major factors for the growth of the fetal and neonatal care equipment market. South Asia and Sub-Saharan Africa account for more than 60% of preterm births worldwide. In India, nearly 3.3 million babies are born preterm each year, and nearly 0.36 of the incidence in children under the age of five die owing to preterm complications. According to Miracle Babies Foundation, in Australia, each year one in 10 babies are born premature, and approximately 15% of all babies require extra care at the birth period. According to an article published in Lancet, China contributes 7.8% of global preterm births. Thus, the rising number of preterm complications and growing population is likely to drive the market. Other major factors responsible for the growth of this market are the innovative product development for infant and maternal care products, rising collaboration of private and public sectors, and increased awareness for prenatal and neonatal care. The rise in the cost of neonatal care with the advancement in the medical devices is one of the major factors hindering the fetal and neonatal care equipment market. The survival of newborn in developed countries is enhanced by the high level of evidenced-based care given to the newborn and routine screening for some congenital disorders. However, many of the screening facilities and opportunities are still not effectively affordable and accessible to people in developing countries due to the high cost of specialized devices in hospitals, inadequate tools, and high expenses for total healthcare delivery. A large number of deliveries are still unattended with a percentage of deliveries taking place outside of hospitals. Thus, these factors hinder the growth of this market. Other factors affecting the market are the stringent regulatory policies for new device approvals and availability of alternative treatments. India is expected to have the largest market share in the forecast period. The primary factors for the market growth in India are a high incidence of preterm birth, the rise in awareness programs from government and non-profits organizations regarding neonatal care, and increasing healthcare facilities with healthcare infrastructure. China is expected to follow, due to the large population base and increasing awareness regarding fetal and neonatal care. The major players include Atom Medical Corporation, Analogic Corporation, Dragerwerk AG & Co., KGaA, GE Healthcare, Koninklijke Philips N.V., Masimo, Natus Medical Incorporated, Nonin Medical, Inc, Phoenix Medical Systems (P) Ltd, and Roche Diagnostics, among others. Follow the current and future of the Asia-Pacific fetal and neonatal care equipment market in the developed and emerging markets.